February 24, 2014 | David S. Maldow, Esq. 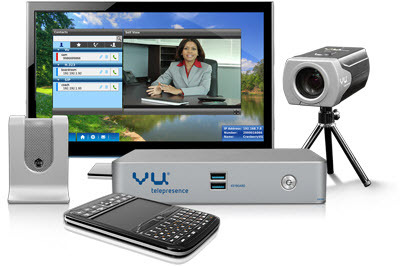 Vu Telepresence has just released a new VC endpoint product. We have been fans of the Vu's affordable, but powerful, solutions for some time. Founded in 2006, Vu has become a leader at its price point. The new 2014 model is really worth taking a look at, with a lot to offer in both form and function. The codec itself is smaller, with a sleeker, more modern style. But don't let the compact design fool you, there is a lot of power under the hood. The new USB camera is also particularly cool, forgoing the typical, heavy, fat-bottomed VC camera design for a decisively sexier appearance. 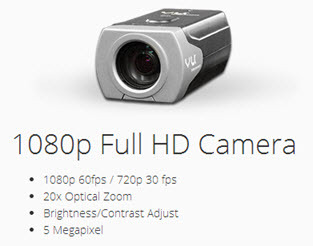 Again, don't be fooled, as the 5 megapixel camera can pull 1080p at 60 fps with at 20x optical zoom. But these are just the basics, keep reading to learn more about this new product, and why it may be exactly what you need to start, or grow, your visual communication environment. Before digging into the new Vu, I would like to briefly address a videoconferencing technology trend, which (in my opinion) has a lot to do with the viability and marketability of this particular product. That trend is the changing nature of the interoperability problems that have historically plagued videoconferencing users. While we still face mighty struggles with protocol interop, we have all but solved the problem of vendor interop. Basically, in the last few years we won a major interop battle, and never even stopped to celebrate. Today, when we talk about interoperability, we generally are referring to connections between various services or protocols. For example, we worry about interop between WebRTC, H.264, SIP, H.264-SVC (and all its flavors), V8, the Skype protocol, etc. The new services assisting VC users, as they address these issues, are fighting a mighty battle which is far from over. But the good news is that things are much better for the typical videoconferencing user, than they were in the past. As little as 3-5 years ago, a call between two H.264 systems from different vendors could be a hit or miss affair. Despite the fact that they were using the same protocol, calls didn't always work well. Having made literally hundreds of test calls between varying vendor systems during this time frame, I can't stress how bad the situation was. Yes, it was possible to call between different vendors, but you had better make a few test calls first and lock down the settings once you get it working. This problem has been all but eliminated since that time. The technology has developed to the point that the vendors' codecs interoperate seamlessly, when using the standard protocols. What this means for today's IT purchasers is that they can finally go for best in breed, or for the right fit or your need. You don't have to brand match, you can go shopping. Any remaining benefits from brand matching can be weighed against the benefits of using your product of choice for the specific application. The implications of this for today's VC purchaser is that it allows for a more custom environment, with right-sized, and right-priced, components based on your needs. In the past, for example, if you had a certain vendor's solutions in your executive boardrooms, you were compelled to use that vendor for your small meeting rooms. If that vendor did not offer a small meeting room solution in your price range, you had a choice of overspending and over building that room, or simply not having video in that room. One unfortunate result of this, is that video has primarily been an elite, boardroom tool, despite its potential revolutionize small team collaboration. 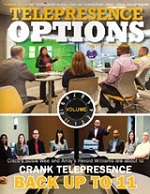 Team meeting rooms are the highways of today's workforce. Before now, you had a choice of driving a Ferrari, or a tricycle. Neither is really appropriate for your typical worker's day to day commute. 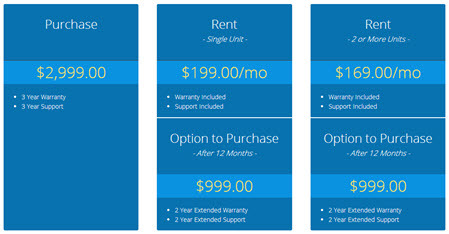 Vu is offering a smart sedan, easy to drive and affordable. But with enough power to be interesting, even to the Ferrari drivers. So now we have the freedom to buy the VC endpoint we want, with the comfort of knowing that it will work well with whatever we already have in place, or plan to buy for the future. 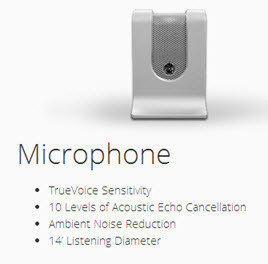 With that in mind, let's take a look at this new Vu product and see how it measures up. Please check out the excellent unboxing video from Vu Telepresence for a quick look at the basic setup and some of the cooler features. While the high quality audio and video components provide the muscle, we appreciate the finesse of features such as the new Magic Keyboard, large local recording storage,�modern contact management, and the simple menu for in-call features. As you can see from the video, despite being priced as a budget system, it has some significant differentiators and power features. Usually, when I introduce a new product, I try to identify the ideal customer or environment for the solution. The Vu solution isn't so easy to pin down, as it could easily suit a number of needs. However, I can generalize into two major categories of potential users. 1. Existing Deployments: Vu works with any infrastructure. Whether you have top end enterprise internal hardware powering your video environment, or have outsourced to a cloud service for a monthly fee, the Vu fits right in. 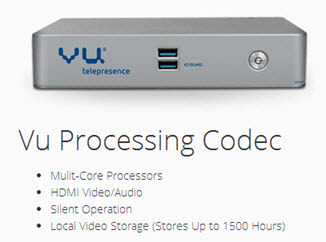 If you want to empower another meeting room with video, a satellite office, or any other expansion, you are free to consider the Vu rather than simply placing an order for more of what you have. 2. 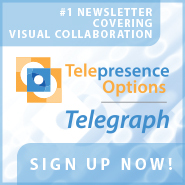 New Deployments: First dipping your toes into the world of visual collaboration? Vu offers a nice quick start, with an open plan for growth. Each Vu has an internal MCU. This means it can host multipoint meetings (several locations, all connected in the same meeting), without any external service. In other words, as soon as you install that first Vu, you don't just have an endpoint, you have the beginnings of a visual collaboration environment. When it is time to grow, whether you go with an external service, or buy your own infrastructure, your existing Vu systems will fit right in. 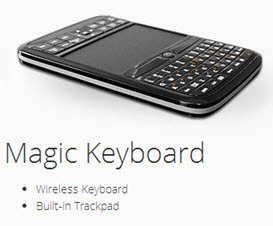 It is impossible to make sales predictions in this industry, but this product has a lot going for it. Vu is reporting that, at this point, they can't keep them on the shelves. There is an undeniably massive market for small team meeting room video, looking for something more than laptop VC, while keeping within the budget. If you are in this market, Vu should be on your radar.